The Syrian government adopted the Arabic National method as a basis in establishment building. This resulted in the beginning of the religious classification, which we witness in some neighboring countries. This made it difficult to determine the population enumeration of these clans, especially since all of them were regarded under the Islamic classification during the years of secondary study. Thus, we mainly depend on previous documents of the French Colonel. The administrative delegate in the western region of Syria numbered Alawite tribe members at around 1,000,000. From the estimation, we gather that Alawites have achieved the highest degree among the Syrian population during the last century: 3 per every thousand and 2.4 per thousand beginning from the 21st Century. The population of the sect may reach about one and half million in our current time. Estimates also tell us that a significant number of citizens weren’t registered at formal departments during the enumeration of ‘Niger’ The number of those belonging to this group could rise to about 1,600,000. LATTAKIA: Throughout the city except for the Mountain of Kurds, the region of Salma and Suleyeb Al-Turkman which is towards the Syrian Turkish Border. It has been noted that they inhabit modern neighborhoods such as Al Masharee and suburbs of the city. The case is almost the same in the city of Jabble, where they are centered in the Northern part of the city and its coast. TARTUS: They are diffused in most of the city, besides a few older neighborhoods in Banyas, and the villages of Al Marqab. They also share the city of Kadmous with the Ismaily sect. They are closely connected and on continuous good terms with the villagers of Wadi al-Nasara, which consists of a majority of Christians, where their own neighbors are Christians in the neighborhood of Safita. HOMS: Homs was inhabited only recently, where they were spread in new neighborhoods.They featured a historical existence in some of the villages that are close to Tartus. HAMA: This sect doesn’t maintain a large existence here, except for some villages such as Abu Qubays and Shatha. Most of the inhabitants of those two towns adopted the Al- Ghasani doctrine. Lastly, Al Murshidi at present, where their existence is recognized only in the suburbs of Al- Sukelbiya and Masyaf. IDLIB: They inhabit many small villages in Kawirko and Al Aliya. DAMASCUS: They are centered in the city of Damascus, mainly in military held areas and modern project settlements, which the ruling family established for families of officers. Despite their large existence in Damascus, their percentage doesn’t exceed 0,5% of the total population. ALEPPO: There are some Alawite families who have given up declaring their original sect in favor of the dominating sect. Their origin could descend from the times of al-Hamadani, where Alawites played a significant role. They are spread out around modern project cities of Syria, such as al-Rmeylan, al-tabqa, and Jibbase. These are areas of importance, which form the base of the Syrian Economy. They feature the homes of Alawite police and army officers in some of the inner regions of Syria and the Eastern regions, specifically in as-Suyada. During their service, they have molded within the community. In spite of the vast diffusion of this sectarian minority, throughout different parts of Syria, their clan roots are still vivid in their original villages, up until present day. They are greatly increasing, with wealthy and powerful investors and smugglers reside, and they tend to spend money excessively in their villages. al-Kalbiya clan: Highest population among the tribes, they also maintain strong political influence. Followers of the al-Haydari doctrine are diffused in the northern regions of Lattakia, where their origin descends from the clans mentioned above. However, the difference between them and the Alkazi doctrine made them far from their clan background and close to each other on the basis of doctrine. This resulted in their sheiks obtaining more importance than their own leaders. This is especially so because their political positions are weak, that makes the concept of leadership quite ineffective at present. 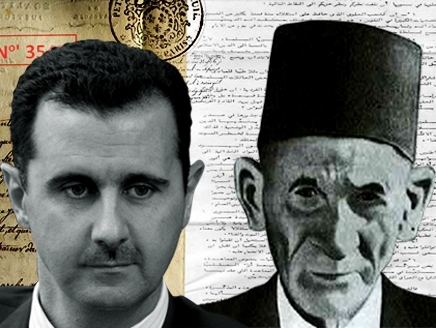 In spite of the fact that Hafez al-Assad, late father of the Syrian President headed the leadership of the familial house, al-Kalbi sect from the al-Kalbiye clan, he held little authority compared to leaders of other well known tribes at the time. Since Hafez’ rule, the political authority in Syria and since worked to create a relatively weaker familial leadership. This was known as ‘Beit Alayilaa, (the house of the family) through adopting the policy of ending disputes by dividing lands of capitalists, leaders and representatives over the farmers who worked on them. This decreased the authority of those leaders and enabled late President Assad to increase his popularity, and he later became the ultimate leader between the poor Nusayris Soon, the existing political authority that was based on the authority of the army, started granting important and sensitive positions to common and active personalities from ordinary Alawite families, who on their part owed loyalty to the President and his family. They marginalized the traditional leaderships in order to grant political authority to new Alawite leaders. Those leaders contributed in granting members of the poor to create followers to them. Due to bourgeoisie psychology, the traditional leaders avoided asking any requests or services of persons who were under their clan, which resulted in the loss of their social and economic state and position, by and by, facing the new leaders. Religious figures: Sliman Halom, Fadill Gazal of Youns family. 3 In spite of their death, their grandchildren obtain a special credit depending on their ancient origin and the state of their parents //the fifties of the last century//. 4 The leader of the mountain revolution between 1919-1921 and 1921. 5 The origin of these two sects traces back to the origin of Fatemah. They joined the al-Matawra clan by means of their inhabited places.